Using colour to create brand cut-through. The correct colour palette will give your brand an extra boost, forever linking your brand with a particular emotion and colour. 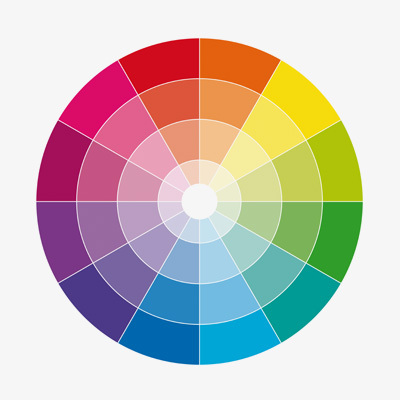 Choose your brand's colour palette well enough, and you'll take ownership of a colour forever. Your brand’s colour palette and how it is integrated throughout your corporate stationery, website design and wider marketing communications, is one of the most crucial elements your branding agency will undertake for your brand. At its most technical sense, colour theory describes the mixing of the three primary colours (red, blue, and yellow) to get the thousands of different shades that make up our colour spectrum. When brands use the phrase “colour theory,” however, they are often talking about not only the process of mixing colours to create distinctive shade, but also choosing colours and shades for their emotive or persuasive values. When brands choose colours, they look for shades that inspire the appropriate emotion or desire within the consumer. It is no coincidence that many fast-food restaurants use bright reds and yellows; these colours gently manipulate viewers into feeling hungry and impatient, the two problems that a fast-food restaurant can effectively solve. Of course, the goal of any brand is to take colour theory one step further, permanently linking itself with its chosen colour. When successful global brands take ownership of a colour. The famous colour associated with the Tiffany brand. When you hear the phrase “Tiffany blue,” you know exactly what colour it means. The familiar robin’s egg shade was first selected for the brand in 1845, when Tiffany founder Charles Lewis Tiffany chose it for the cover of Tiffany’s Blue Book. Now, the signature blue colour, officially designated as Pantone 1837, is a registered trademark of the Tiffany brand. The colour has become so exclusively associated with Tiffany that no other manufacturer or company can use it. The Cadbury brand has successfully taken ownership of the colour purple. Keep in mind that each of these brands uses their chosen colour slightly differently, and that colour theory is based on finding the right shade in addition to the right colour. McDonald’s red is often listed as Pantone 485, while Coca-Cola red is listed as Pantone 484; these two shades are nearly identical, but successfully differentiate the two brands’ emotive values. How your branding agency can use or subvert colour theory. When it comes time to define the colours for your brand, there are two routes you can take. Taking the obvious path means using colour strictly for its stated psychological value. Demonstrate physical power with bright, deep red. Communicate intellectual prowess with dark blue, or give a sense of peaceful calm with a lighter blue. Research colours thoroughly and choose the perfect shade for your desired message. The second path is a subversive path. What if you chose luxury colours like purple and gold for your fast-food restaurant or mass-market product? Playing with colour meaning can often give you inspired solutions to make your brand stand out: adding blue’s intellectual values to a clothing company logo to attract the smarter set, or adding impatient yellow to a bookstore awning to inspire people to dash inside for just a few minutes. Whichever direction your branding agency recommends, the right colours will give your brand permanent impact, and help set your brand apart from the rest. Taking the time to fully research colour theory and choose the right shades may be the best thing you can do to promote your brand.